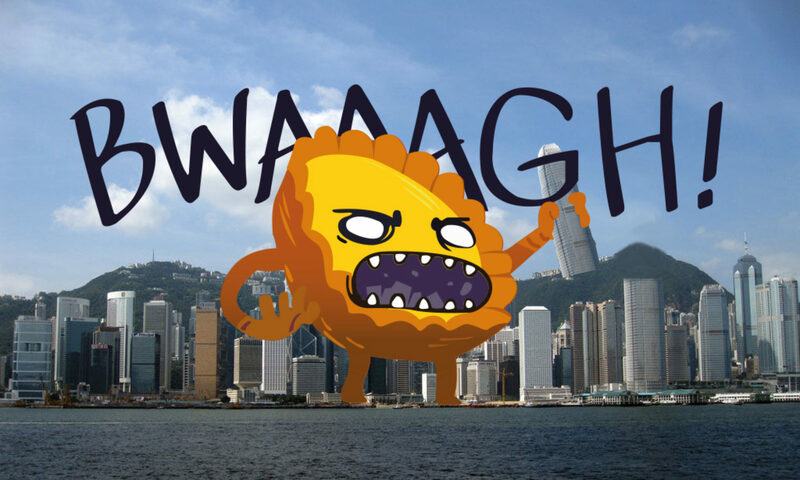 This is the second in a series of articles in which we explore the cryptozoology of Hong Kong. Each month we’ll be taking a close look at one of the city’s many imaginary creatures. 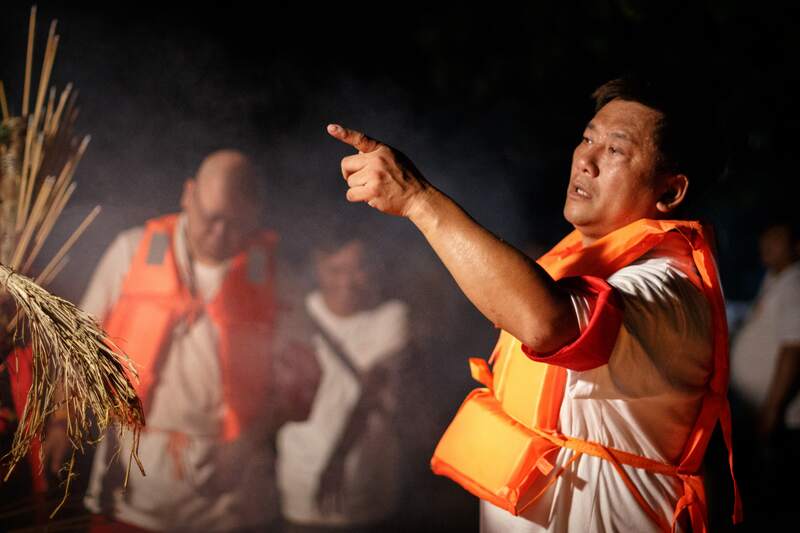 This is part two of our story of the Pokfulam Fire Dragon – you may want to read part one first. On the eve of the Mid-Autumn Festival the skies over Hong Kong are awash with dragons, bringing rain and heralding the changing of seasons. I approach Pokfulam under glowering storm clouds. 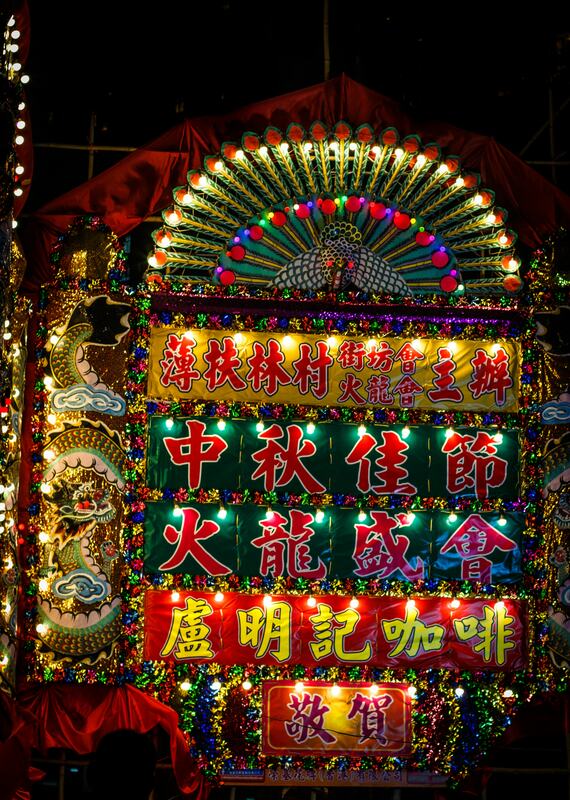 The village gates have been transformed by two enormous fa pai (花牌) that glint against the iron grey in bright crimson and emerald green. Colourful pennants flap wildly in the breeze giving both a festive and martial air. ‘I’ve no time to entertain you!’ yells Alun Siu, who is in charge of this year’s Pokfulam Fire Dragon. ‘If you want to film, then film! I can’t help you right now!’ Distributing t-shirts and yelling directions to his many subordinates, Siu certainly has his hands full. 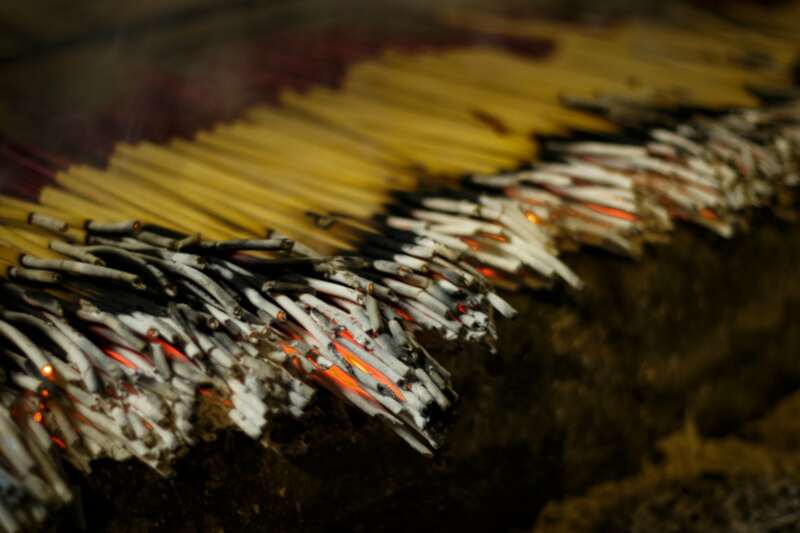 The early evening air is already laced with incense; coiling tendrils of smoke tumble softly over whole roasted suckling pigs, laid out on a folding table amongst other offerings. Police have cordoned off a lane on Pokfulam Road, where the fire dragon’s head lies in wait. An enormous Fa Pai transforms Pokfulam’s village gate. I manage to wangle a press pass before making my way through the village. Soon these narrow lanes will be thronged by the dragon’s procession, but for now they lay quiet and calm. The village stream burbles in the background and the sound of a television wafts out on the breeze. Paper lanterns hang here and there while a laughing child greets his father, who is returning home with an armful of groceries. . A small square enclosed by a low brick wall has been laid out with long tables for the coming bacchanal. Strings of candle lit lanterns radiate warm light in the gloaming. 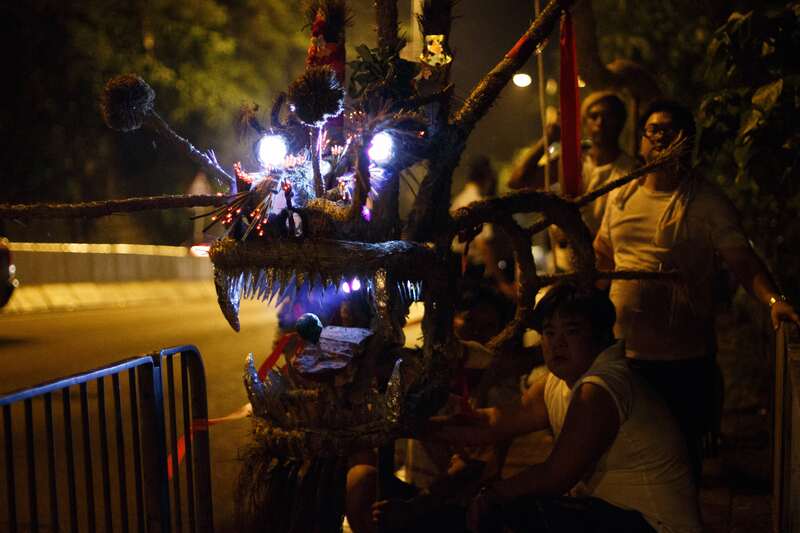 A lane of traffic on Pokfulam Road is closed off while the fire dragon waits. Night descends on Pokfulam as we make our way past an immense mural of the fire dragon. 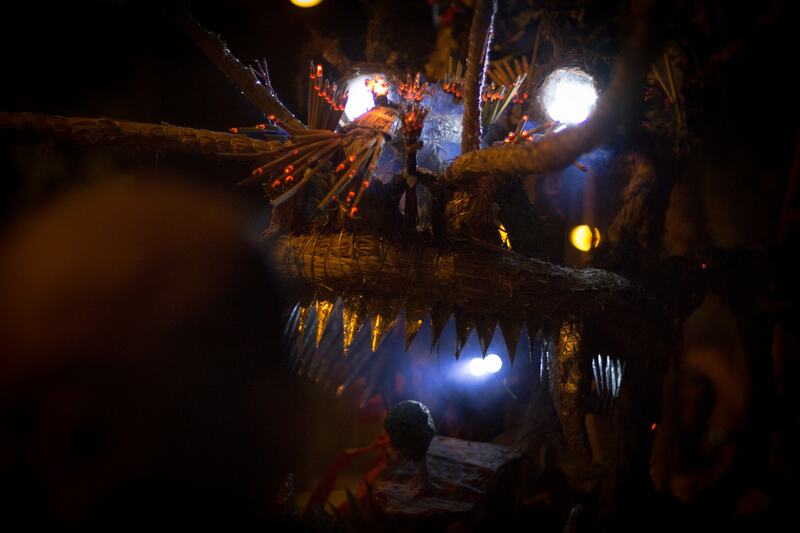 We emerge to the sound of drums – the lighting of the dragon’s eyes has begun. The crowd has grown as dense as the acrid smoke that now climbs the air. The dragon’s sinuous straw body has been brought up to the road and attached to its head with thick rope. 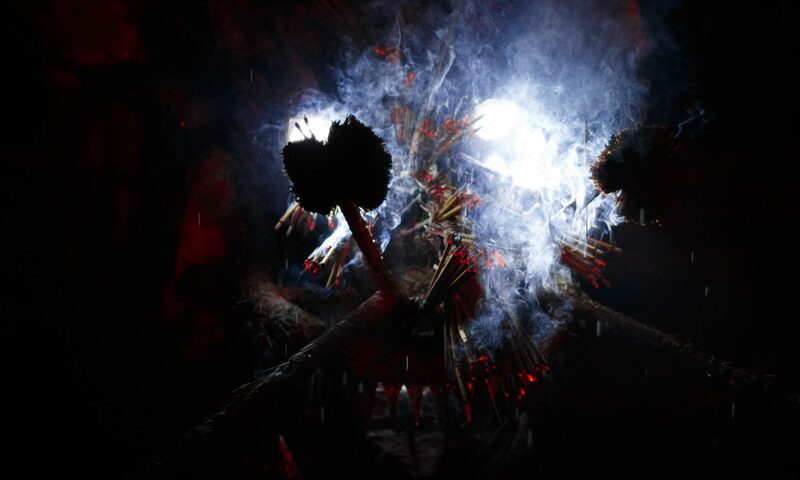 Ten-inch incense sticks have been poked into the creature’s straw flanks. 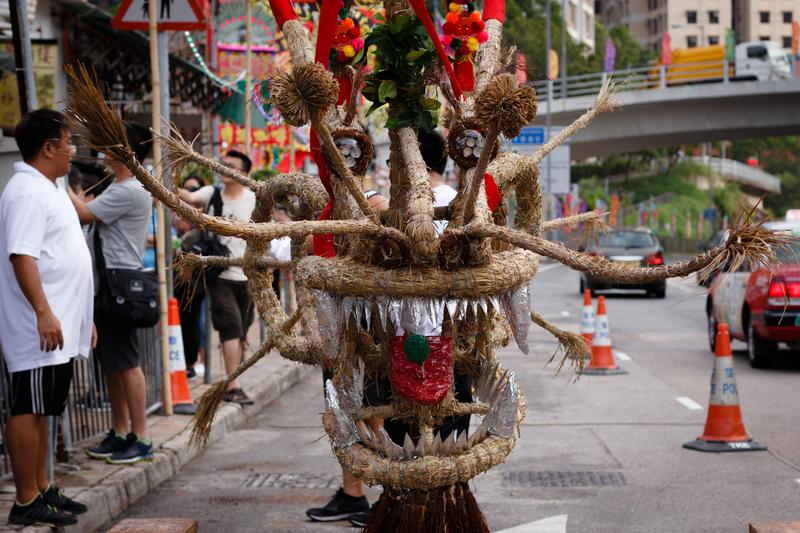 Resembling a winding pin cushion, the dragon is being brought to fiery life by visitors and villagers who pluck incense sticks from flaming piles on the curb. Piles of incense left on the curb for villagers and visitors to add to the dragon. Taking my place near the village bus stop I hear a deep volley of drums as the crowds part and the dragon emerges in all its conflagrant glory. Onlookers move in closer and the police tighten their cordon as the writhing creature parades before seated VIPs. The dragon’s LED eyes are ablaze as its bearers go at full sprint, raising and lowering the beast in a wave of straw and fire. Escorting the dragon from the Temple of the God of the Underworld. The dragon begins its circuit of the outer village and makes its way past Chi Fu Estate. In the confusion I find myself within the dragon’s entourage. 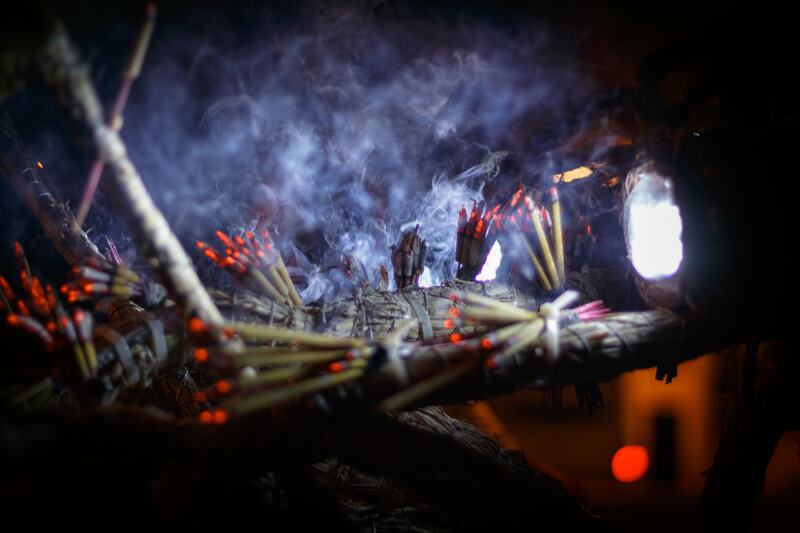 With glowing incense inches from my face and no chance of escape, I’ve little choice but to keep pace and stay out of the way as the procession descends to the Temple of the God of the Underworld (西國大王廟). Our progress is momentarily slowed as the dragon’s long whiskers become entangled with a road sign. With a great roar, the dragon’s bearers break through and carry on to the temple. The dragon bearing down on an onlooker. Illuminated by candles, the temple is an isle of silence. 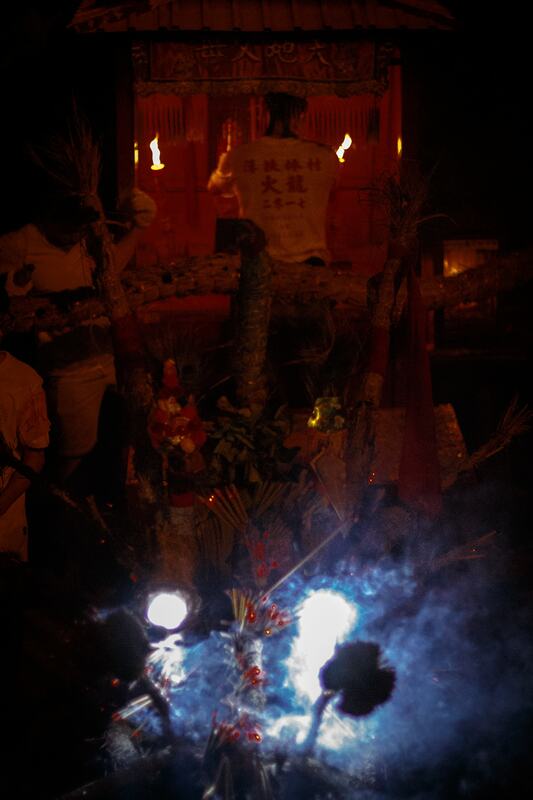 Offerings of incense are made at the altar and the dragon seems to be in repose. Smoke rises through its white-hot gaze giving it the look of its fire-breathing European cousins. In the dark, it is as though this construct of straw and bamboo has taken on the spirit of a real dragon. Rain begins to patter as we huddle under a corrugated shelter. ‘Just a passing cloud, carry on!’ yells an officiant. With worship concluded, the drenched cortege returns to the world of the living. The dragon lies in repose as offerings are made at the temple. Patting myself down I realise that at some point, in the scrum, I’d lost the press pass. Internally groaning, I wonder how I’d see this through to the end – I’d already been told that without the pass I’d be barred from seeing the conclusion of the ritual. Dejected and wondering whether to stay, I wander back to the village to meet friends. Passing under an enormous Fa Pai. Passing under one of the fa pai, we come upon an auto repair shop where enormous stock pots of congee are being prepared next to a Toyota propped up on an auto lift. A white Maserati pulls in, followed by a retinue carrying roasted suckling pigs that had been amongst the offerings at the front of the village. Under flickering fluorescent lights a shirtless man hacks the pigs into bite sized chunks. In the background I can hear the roar and scatter of mahjong tiles. Tucked away behind the garage is one of the village’s most famous oddities, the Li Ling Fairy Tower (李靈仙姐塔). ‘This pagoda is certainly of great historical significance!’ exclaims a camera wielding man directly behind us. When pushed to elaborate he concedes that the story is ‘unclear’. This is always the case when it comes to the Fairy Tower – its story has been passed down orally and the details are lost. A diminutive man with a rattail haircut and a face creased in smiles invites us to sit and eat. He proffers large bowls of fried noodles and pieces of blessed pig. He motions magnanimously to a large tub of ice on the floor and soon Carlsberg and Heineken flow copiously. ‘The Boss’, a tall man with an immense jade amulet dangling above his bare belly, comes round and we toast to the Mid Autumn Festival. A pipe smoking gent with a Billy Crystal perm wanders in and joins the celebrations. The party is in high spirits when suddenly a great cheer erupts and confetti cannons are fired – the Fire Dragon has arrived to offer blessings at the Fairy Tower. 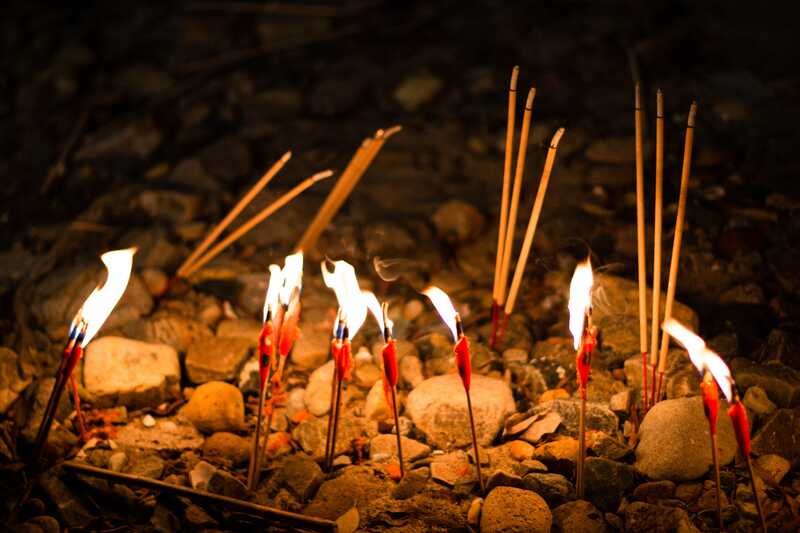 With lit incense inches from my face, I have not choice but to keep pace and try to keep out of the way. The rocky shore of Waterfall Bay by candlelight. Emboldened by the villagers’ festive cheer and refreshed after a short nap in a Tin Wan McDonald’s, I hop on a bus to Wah Fu Estate where the Fire Dragon is due to complete its journey. By the time my bus pulls in the dragon has already arrived. I bypass the large crowd that has assembled around the cacophonous entourage and make my way through the shuttered housing estate. Families have laid out midnight picnics all along the path to Waterfall Bay and children chase each other with their cartoon character lanterns. An officiant directs the dragon’s head to be raised. The Fire Dragon team has placed a sentry by the stairs to Waterfall Bay. I decide to give gentle persuasion a try. No luck. I’m told that even with a press pass I wouldn’t have been allowed down on to the beach to see the ritual’s climax. The clamour of drums and cymbals grows louder in the distance as the Fire Dragon approaches. I wait with all the others and watch as several journalists attempt to sneak past the police. All are turned away; one is even forcibly yanked backwards by the backpack as she tries to blend in with the procession. As I resign myself to missing what I’d waited all night to see, a familiar face appears in the crowd – Alun Siu. ‘This one can come,’ he says to the policeman who steps aside and motions for me to move along. The atmosphere is solemn down on the rocky beach. Drums beat while the waterfall whispers in the background. Waves lap on the shore and candlelight illuminates the dragon’s head, which has been placed on the sand. The procession, now in bright orange life vests, stands at attention as incense is replaced. ‘Time to go! The tide is coming in! Time to get in the water!’ someone yells from the back. A heavy set man lifts the head from a squatting position and is helped to his feet as he stumbles under the weight. There is a brief flurry of excitement as the dragon’s head catches fire. Straw smoulders as a loud cry is raised from the gathered crowd. The dragon is hoisted high in the air; drums and cymbals intensify as it parades one final time. ‘Get out of the way! Out of the way!’ Alun Siu yells, clearing a path to the sea as the entire beast races towards the water. As he enters the surf, the head bearer stumbles to his knees but is quickly hauled up by the armpits. The dragon continues marching slowly into the deep, its flashing eyes shine bright as ever, their beams pierce the water even as they submerge beneath the murk. One by one, the sea extinguishes every glowing ember. The drums grow quiet as the dragon strides into the waves, then finally rise up in a crescendo. The gathered crowd rejoices with one great yawp and the bearers raise their arms in victory. A water fight ensues. All seems calm as we make our way past the roaring waterfall and back up from the beach. 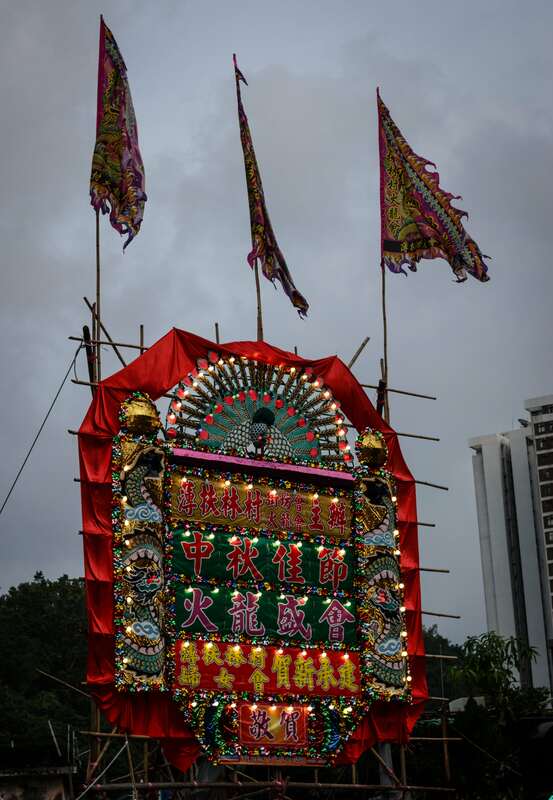 Good fortune, health and luck are assured for the village. Under the crisp light of the full moon, the summer heat lifts momentarily and I feel the kiss of autumn’s first breeze. 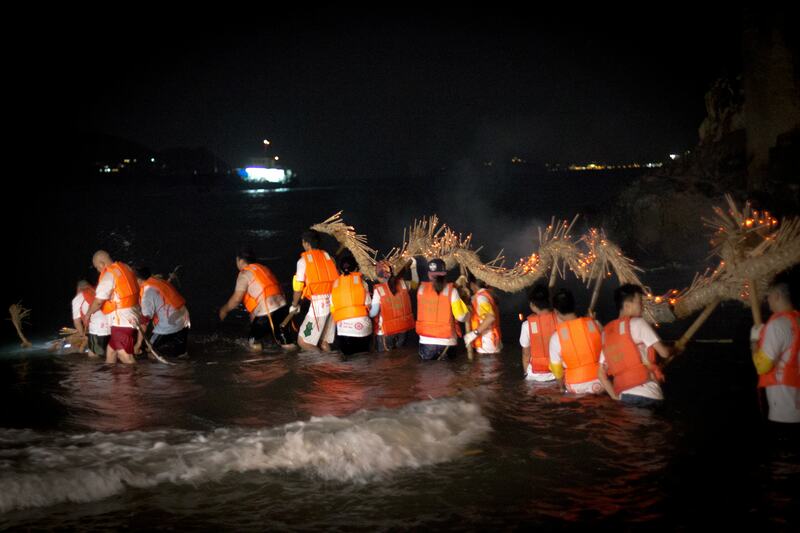 The dragon being sent off into the waves.